… Great lyrics and beautiful song by Bonnie Raitt. I’ve always loved it. When I was a naive twenty-something, I used to play it intentionally for a boyfriend of mine who just couldn’t seem to say those three little words to me – I … LOVE … YOU – let alone feel the emotion for me. I fed our hole-in-the-wall-hang-out jukebox way too many dollar bills to play that song to try to make him love me. You see what I was doing there, right? Playing a song called “I Can’t Make You Love Me” in which the lyrics talk about not trying to make the other person love you and giving up on the fight to make them love you, because of course I was going for the ‘ol passive aggressive, reverse psychology strategy. For way too much of my life I have tried to get people to like me, or yes, even to love me. Because if someone didn’t like me, something had to be wrong with me. Duh! 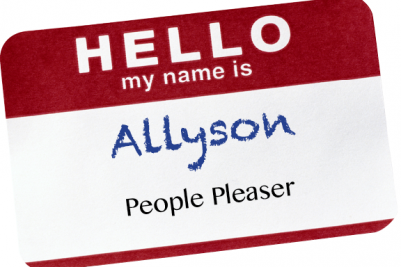 Hello, my name is Allyson, and I am a (recovering) people pleaser. A person so busy trying to please others and worrying about pleasing them that I never really stopped to think if I was pleasing myself. A person dependent on the happiness of others in order to be happy herself. A person trying to fix people who most likely don’t want to be fixed. Say whaaaa??? I know it sounds like crazy talk to all you normal peeps. But just go along with me here. I’m now 38 and am able to see my people-pleasing self from a different perspective. Go figure. Almost four decades into this crazy journey and I am seeing the light. What finally happened? I hit a bottom. I sank into such a darkness that I had no choice but to see the light. Well, it was that or drown in the darkness. ‘Twas but one of many a bad choice … a bad relationship that my people-pleasing radar honed in on. Ya see … a people pleaser, also sometimes called a codependent, is often drawn to those that seem to need to be saved, helped, cared for. Because it’s easier to care for others than to care for yourself. That’s how my crazy mind works … worked … I’m working on it! Admission: I knew on the first date that he was bad news. I’ve probably said that within the confines of a therapist’s office or a support group meeting but never said it in regular conversation or blogged it out loud. Flags everywhere. But he was handsome, he needed helping and he liked me. That’s how high my standards were. He was an alcoholic. I chose not to see that. Or saw it and thought I could change it. I took it on. I am 100% responsible for my relationships. Bejesus … do I sound like an infomercial for a self-help cult or what? At the risk of sounding too coo coo for cocoa puffs and having you not like me, I do believe it’s true. Not the self-help cult part. The 100% responsibility for our relationships part. I’ve chosen all the relationships that I’ve taken on. Instead of saying “hey wait a minute, this person doesn’t like me … that’s okay” and letting go, or listening to my gut, seeing the flags and smoke signals telling me to get the hell out of dodge … I plowed through with a fierce determination, stubbornness and a learned behavior to put myself in a situation that only I could put myself into. So there I was, again. A bad situation. My worst. He was addicted to alcohol. I was addicted to FEAR. Afraid I wouldn’t get home in time to have dinner with him and keep him in for the night so he wouldn’t go out and drink. Afraid he’d go to the corner store for a cigarette and not come home. Afraid he’d be in a bad mood when he was hung over. Afraid to say the wrong thing, which would make him drink. Afraid to let anyone know what was going on. Afraid to be alone but afraid to be around the ones I loved. Afraid of not being good enough. For anyone. Anymore. It lived in the hollow of my gut and spread from there. A bacteria eating its way throughout my body. I didn’t know how to feel anything else. I needed FEAR. It got me high on anger which led to the lowest of lows with more bad decisions, actions and reactions and bouts of isolation. It took me over, from the inside out. My immune system said ENOUGH. My soul unraveled. I was ashamed. Of where I was. Of what I was. Of who I had become. FEAR IS A LIAR. I saw a photo on Instagram recently with that saying. It takes what it wants if you allow it to. It can become your reality but not your truth. It can bury the truth in the murkiness but never make it disappear for good. You may have to do a hell of a lot of digging to get it out from underneath that big bad pile of FEAR, but it’s still there. I hit maximum murkiness in 2011. I’m still digging away at the fear. It’s not so big and bad anymore. I can see the truth that was lying underneath the downfall of that relationship and beyond, to the truth that is beneath that. Years of fears. Layers. Lots of layers and new discoveries everyday. Deep breaths. More layers. Gratitude. More layers. Surrender. More layers. Love. More layers. Progress. I can’t make you love me or like me if you don’t … and I’m not going to try to convince you to. As much as I might want to – old habits die hard. I’m going to love me. Like me. Because I didn’t for a very long time. And I’ll still love that Bonnie Raitt song. But for completely different reasons. Tags: addict, Addiction, alcoholism, codependency, fear, people pleaser, self help. Bookmark the permalink.